It's near the beach an a good restaurant. It had a nice bed and a HUUGE refrigerator (unnecessarily so), but everything else is old and tired.The worst part is probably the large lady at the desk. She was not very pleasant. At one point on my way to my room I saw her sitting there talking to another male worker. About 5 minutes later I called to get the WiFi password and was sent to voice mail. I went down to get a soda and behold! These two people were in the exact same place they were a few minutes earlier. I guess a customer calling was not important enough to interrupt their conversation. I also saw a lot of... "undesirables" lurking around, standing outside of their room yelling, etc. "he's my baby too! ", etc. etc. Not fully recommended, but OK in a pinch, or if you want to save a few bucks. Lobby reeks with odor masking chemical. Two front desk staff. One on the phone, one monitoring phone transaction. I was left unattended until the phone call ended.... rude first impression. Elevators filthy. First room had broken thermostat on ac. Everything at the complex needs paint. Tile floor in room is filthy. Remote for TV didn't work. This facility needs maintenance. Thankfully, bed was clean and comfortable. Very nice for the price and easy beach access for across the street. Good location. Front desk staff was wonderful! Cool pool. Has icre cream shop on site which is great for kids. To start, there was no "Do Not Disturb" sign available. The first day while working in the room I had 3 staff members try to come into the room. I did ask all 3 for replacement towels, I had spilled a soda and used them to clean it up. I never saw any of them again. The room I had came with a corner window, which had not been cleaned on the outside in quite some time. And every night I had to re-tape the blinds closed so as to not be awakened at sun up with light pouring into the room. Staff removed the tape just about every night. ( was working well into the morning hours, so 6am came way to fast) The toilet did flush, but...lets just say it worried me. There was an odd smell outside my room. It did not come into the room, but it was there when I opened the door. The pillows are in drastic need of replacement. Internet connection was UNSTABLE!!! (had trouble with it for 5 days) It was off and on all weekend. The only good thing about the location was the proximity to the event going on. This is not a 5 star hotel...However, it was clean, the staff was polite, and it served its purpose for our 1 night stay. The room had a full size fridge and a blowdryer, both which were unexpected. The walls were missing paint and the corner window was dirty. Everything else was clean and the king bed was comfortable. The room wasnright for the price. Breakfast was bad, sign said there was a bar and gril in the hotel... but there wasn't. The hotel had a snack shack that was way over priced. Building was outdated, pillows were thin and very uncomfortable. Remote didn't work for the television. the stay was fine. Hallways and elevators and the back parking lot area was dirty as not cleaned in some time. I had to inform the desk staff to get things cleaned which should be a daily duty. A lot of the hotel need some repair and a fresh coat of paint. Daily room cleaning staff were great. Good location. Across the street from the beach. Walking distance to The Hangout. We stayed at this hotel for 2 nights. Although they have signs posted in the lobby (and everywhere else) about NOT SMOKING and the fines they would charge, our room reeked of heavy smoke. The guests next door openly smoked in their room (with the door open). Our room also had a damp, mildew smell which made the linens feel damp as well. Luckily we stayed out of the room 90% of the time, just returning to sleep at night. Arrived late check in was quick. Had good breakfast. Was a great location ! Hotel was nothing special but was a good place . And my kids loved that it has its own ice cream place ! Good place for the money . Woukd stay again . Looked nasty, smelled nasty and there was food in the sink. We were horrified to even sit anywhere. Left in 5 minutes after check in. Staff was very rude. 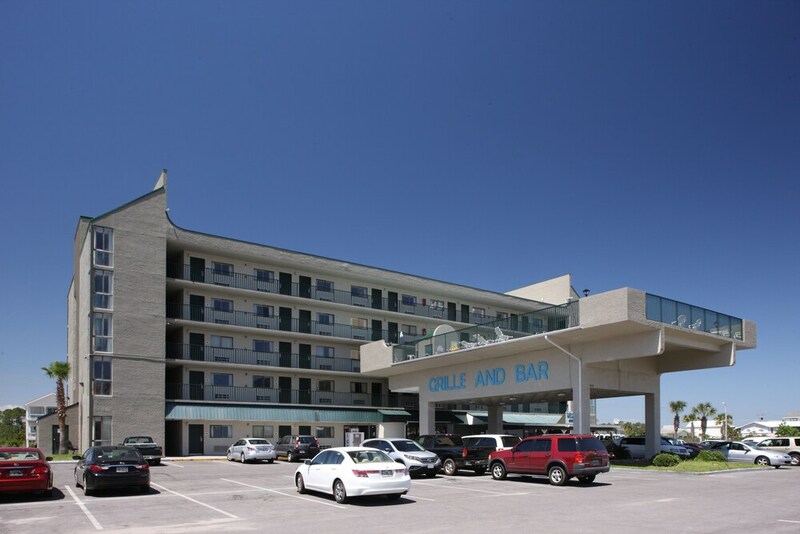 Gulf Shores Beach is within a 5-minute walk of Beachside Resort Hotel while other popular sites like Alabama Gulf Coast Zoo are within a couple of miles (3 km). This 100-room hotel has free breakfast along with conveniences like an outdoor pool and free in-room WiFi. Free continental breakfast is served each morning from 6:30 AM to 9:30 AM. Guests can expect to find free WiFi and 46-inch an LED TV with cable channels. Other standard amenities include a refrigerator, a microwave, and free local calls. Beachside Resort Hotel features an outdoor pool and laundry facilities. If you drive, put free parking to good use. The 24-hour front desk has staff always at the ready. Thank you for taking the time to post your review. I would like to apologize for the issues that you had. We will do our best to correct these in the future. Thank you so much for your review. We hope you come stay with us again soon. Thank you so much for sharing your feedback with us. I would like to apologize for the inconvenience you encountered during your stay with us. I am going to share your concerns with our staff, and we will correct these problems so that our next guest does not encounter this. Free continental breakfast is served daily from 6:30 AM to 9:30 AM. Recreation features at Beachside Resort Hotel include an outdoor pool. The preferred airport is Pensacola, FL (PNS-Pensacola Intl. ): 64-min drive, 37.4 mi/60.2 km.